With business intelligence, workflow automation and other innovations, manufacturers have started to reimagine their shop floors. But don’t think robots are replacing your job anytime soon—instead, these developments are making operations safe, efficient and compelling. These advantages extend to buyers, who receive high-quality products and services right on time. 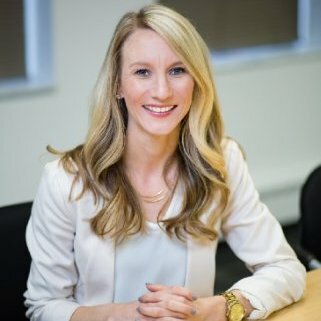 So how can your business start building a factory of the future? Enterprise resource planning (ERP) software is the backbone of any Industry 4.0 company. Without it, your data and processes are siloed in different departments, preventing the connectivity and insight that defines a future-ready factory. 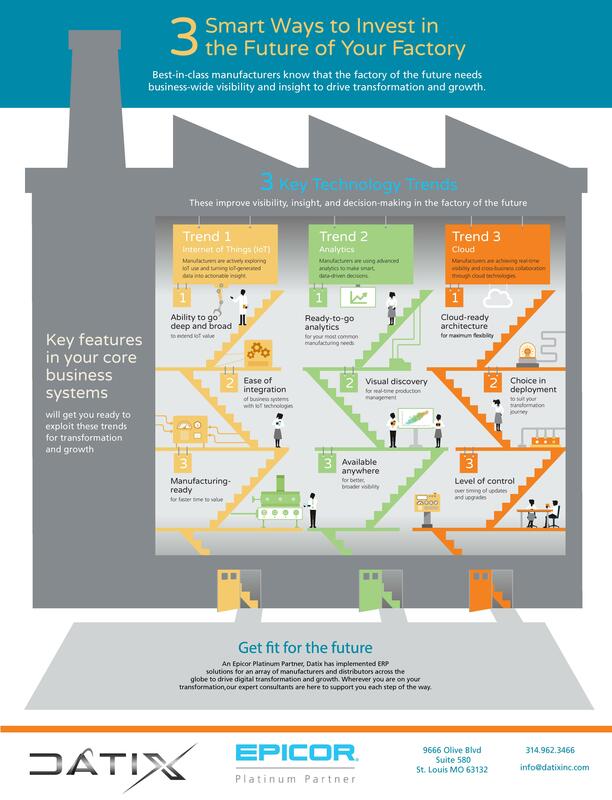 The following infographic explains the digital requirements for building a factory of the future. 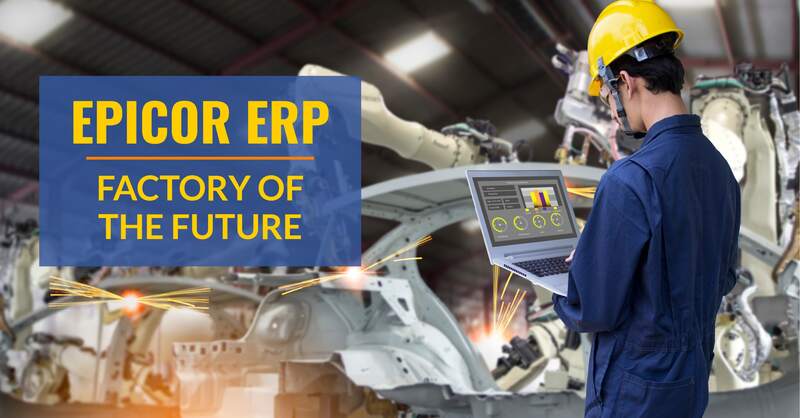 Keep reading to find out how Epicor ERP can fulfill all these requirements and more to transform your manufacturing floor. Click on the above image to view the full-size infographic. Modern manufacturing success is all about putting the customer at the center of everything. That means providing personalized products whenever a buyer needs them, answering customer questions instantly, offering comprehensive services and knowing what consumers want before they even know. This level of insight sounds impossible, but with disruptive technology, the impossible is becoming reality, empowering manufacturers to create customer-centric operations. ERP drives customer relationships by including robust forecasting and visibility. Epicor ERP includes Kanban tools that provide up-to-date visibility into future demand to downstream cells and suppliers, helping you stay ahead of customer demands. Nuanced production control also gives manufacturers the agility to tailor orders to each buyer without sacrificing efficiency. But to truly meet customer needs, you must connect your ERP instance with CRM. Instant access into front and back-end data enables 360-degree visibility. Your demand planning and forecasting becomes even more accurate when your ERP system has access into the customer data housed in your CRM. Additionally, users can leverage consumer interactions from the CRM to develop new products and services based on their feedback. On the sales side, representatives can instantly view order statuses, pricing, inventory and more to always offer up-to-date information to clients at a moment’s notice. ERP and CRM integrations create end-to-end transparency and efficiency to help you stay ahead of consumer demands. Enterprise connectivity isn’t just about software integration. According to Gartner, 20 billion “things” will be connected to the Internet of Things (IoT) by 2020. IoT extends beyond connected devices that allow us to turn off our house’s lights when we’re away or smart watches that collect data about our health and exercise habits. IoT is also leveraged by manufacturers to gain real-time data on products and shop floor operations. Devices and sensors can track your equipment’s performance and detect issues in your customer’s products. However, this wealth of data adds no value to your company if it isn’t fielded into a robust ERP system. ERP transforms big data into readable reports, notifications and analytics to drive smarter decision making. For example, data from your products can identify upcoming field service needs or upselling opportunities. Insight into the entire supply chain shows where goods are in transit and issues in your product lifecycle, enabling users to make powerful improvements. When ERP and IoT are joined, the guesswork is eliminated from decision making. Users can easily drill into distinct processes and datasets to identify shortcomings and design innovative solutions. Cloud computing is increasingly becoming the norm in manufacturing. In addition to being more affordable, cloud solutions drive digital transformation. Without the cloud, there’s no IoT. There’s no ability to check in on production schedules or inventory from your mobile device. Total connectivity and real-time updates are made possible only when you deploy your ERP in the cloud. But there’s another advantage of cloud hosting essential for future business success. As resources dwindle, enterprises will become forced to seek different methods to reduce their carbon footprint. Cloud software doesn’t require on-site hardware that runs up your electricity bill, making it an effective solution for lessening your environmental impact and your costs. A WSP Environment Research study reported that cloud-hosted software emits 95 percent less carbon than on-premises systems. This makes cloud-hosted ERP a far greener way to run your business. Leading manufacturers always look a step ahead, finding new solutions and predicting the next trends. This proactive approach isn’t possible without ERP software. ERP helps you get the most from your data, so every decision is based on accurate metrics and advanced analytics. It’s this level of insight that gives manufacturers an edge over their competition. To future proof your enterprise, team up with a software expert. Datix, an Epicor Platinum Partner, has equipped manufacturers and distributors with ERP solutions and services for over 20 years. We work closely with our clients to fully execute software projects in line with each business’s unique needs. Plus, with our Unity integration solution, we provide clients with a single source of truth. Unity seamlessly connects Epicor ERP with CRM, eCommerce or Marketing Automation software to optimize customer journeys and supply chain operations. If you want more tips on becoming a factory of the future, get in touch with an expert at Datix today!